Carl's Curios: Measure for Measure etc. 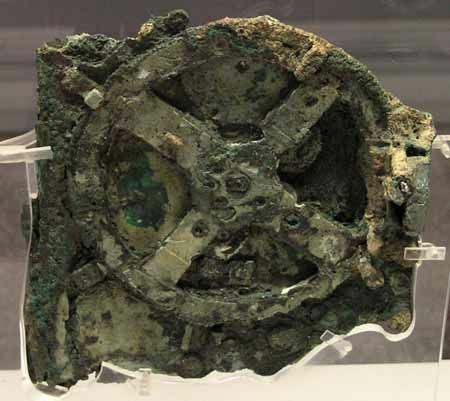 (1) That is theAntikythera mechanism, which was retrieved from a wreck in 1900. It takes its name from the island Antikythera, off which the wreck was lying. The wreck has been reliably dated to the first century B.C., and the geared mechanism seems to date from the same period (although, as there is nothing similar extant to which it can be compared, I think it quite possible that the mechanism was not brand new when put aboard the ship which was carrying it. No way of knowing, I think).The purpose of the mechanism is not fully understood, but it appears to have shown th motions of the sun, moon, and gives other astronomical information. Cicero (106 - 43 B.C.) mentions the fact that Archimedes (c. 287 to 212 BC) made models that reproduced the motions of the heavenly bodies, but he does no inform us of their appearance or how they worked, and I think that probably Cicero was totally ignorant about these points. The Antikythera mechanism contained at least 31 gear wheels, one at least being a contrate wheel. I have heard it argued that the Anikythera mechanism could be the one that Cicero mentions as having been made by Archimedes, but I think that this is theorising far in advance of any available evidence ( of which there is only the mechanism itself). I don't know, but I do hope that enquiries are still continuing. (2) A brass and rosewood device for measuring and marking wood - can't remember the name of it. Probably early twentieth century manufacture. 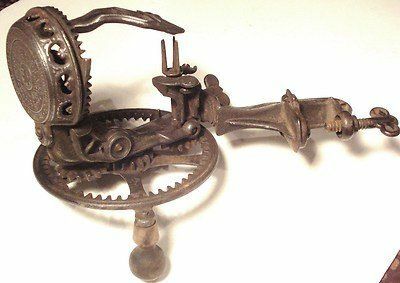 (3)An iron kitchen device for peeling and coring apples. To the right is a device for clamping it to the kitchen table. At the bottom of the picture is the crank for operating the machine. I tried one of these some decades ago, and it worked well, provided the blade was sharp and the machinery oiled and in good order. Probably made circa 1880. 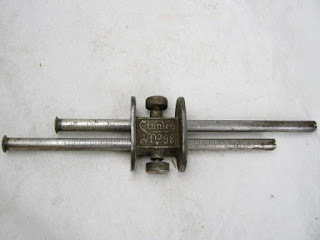 (4)A Stanley device for converting one set of measurements (say inches) to another (possibly centimetres). About 1900, I'd guess.